In February, at the International Solid-State Circuits Conference (ISSCC) in San Francisco, two teams presented new work (PDF) aimed at building better-performing and lower-power vision systems that would help aerial robots navigate and aid them in identifying objects. Dongsuk Jeon, a graduate student working with Zhengya Zhang and IEEE FellowsDavid Blaauw and Dennis Sylvester at the University of Michigan, in Ann Arbor, outlined an approach to drastically lower the power of the very first stage of any vision system—the feature extractor. That system uses an algorithm to draw out potentially important features like circles and squares from an overall image. To navigate and to determine whether a scene looks familiar, a micro air vehicle needs to be able to use its entire field of view. But existing full-image feature-extraction algorithms are built to run on desktop computers and servers, not battery-powered platforms, Blaauw says. He adds that although there are some low-power feature-extraction algorithms, those tend to focus on very specific applications such as face recognition. Jeon and his colleagues also incorporated a few hardware tricks to cut down on the power usage. One approach was to rework the shift registers that act as buffers for data that’s in process. Typical shift registers are made up of cells with two latches—circuit components that contain about 10 transistors each. The team found a way to rework the registers so that their cells each contained only one latch. The resulting registers were just as fast, but because they contained half as many latches they lost half as much power from leakage. The team’s accelerator, which consumes just 2.7 milliwatts of power, was made using a 28-nanometer manufacturing process. The core clocks at a very low 27 megahertz, which keeps the power consumption down; the clock on a typical vision system-on-a-chip works at more than 100 MHz. Although feature extraction is just one aspect of vision systems, Jeon says, it can take up as much as 70 percent of the area of the core on a vision chip. Another approach, led by IEEE Fellow Hoi-Jun Yoo at the Korea Advanced Institute of Science and Technology (KAIST) in Daejeon, South Korea, is to attack the vision problem at the complete chip level. Yoo’s team has built an SoC with 21 image-processing cores. 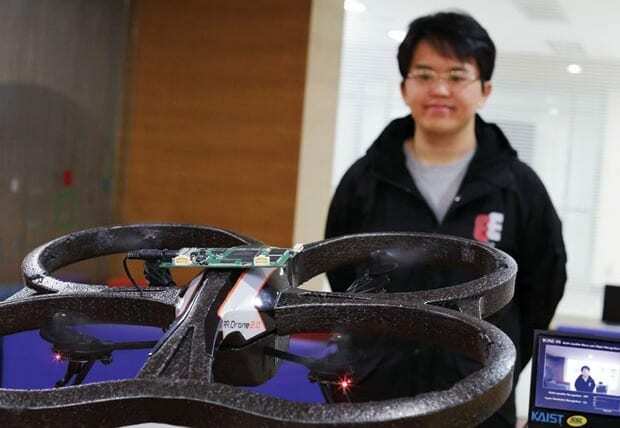 The chip, which has been demonstrated on a toy car and on a four-propeller flying robot called a quadrotor, is capable of distinguishing faces and differentiating between objects and pictures of objects—for instance, a car and a billboard carrying the image of a car.